One of our favourite local promoters, Endless Window, called it a day on their activities late last year, and the region’s alt. music scene has been all the poorer without them. 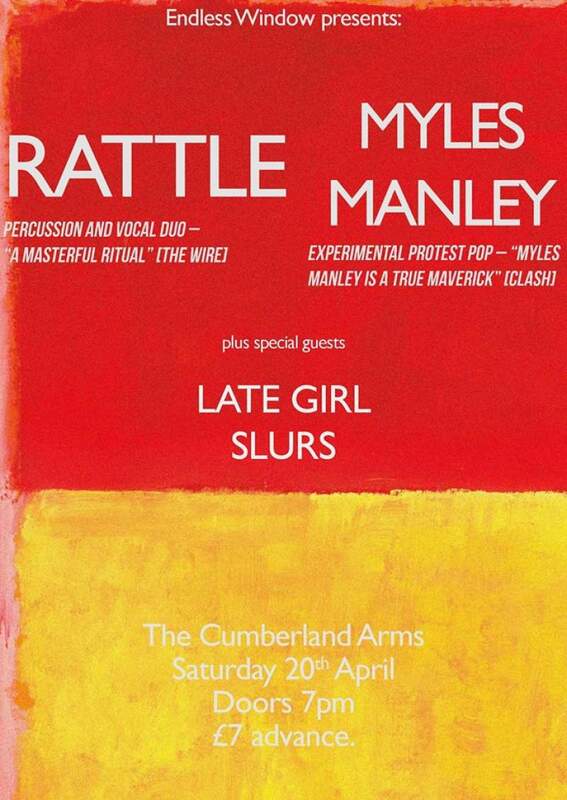 Famed for their dedication to “art, disco and noise”, their legendary nights at Newcastle’s Cumberland Arms were a favourite among punters and musicians alike. Thankfully, EW aren’t averse to the odd one-off show, and they’re returning with an Easter Saturday co-headline show from a couple of true musical mavericks. Sligo’s avant-pop songwriter Myles Manley is no stranger to EW’s line-ups, having performed for them on numerous occasions. Concerning himself with creative takes on leftfield pop, Manley is a consistently provocative and inventive performer. Sharing headline duties are Nottingham duo Rattle, whose drum and vocals set-up is consistently praised for its imaginative and meditative take on hypnotic minimalism. Not to be outdone, the North East contingent provide suitably off-kilter support, with electro-acoustic surrealism from Late Girl and fuzzy power pop courtesy of Slurs, ensuring Saturday 20th April heralds a welcome brief return for Endless Window.